Sometimes we get so caught up in themed room decor for kids we forget to go a little crazy & add in that conversation piece that will make them smile. 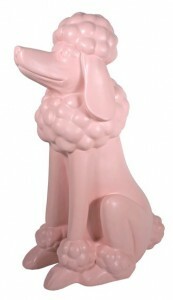 This snazzy poodle is a lovely shade of pink & will look outstanding in a bookshelf, on a desk or dresser. She stands 14.75″ tall & serves no purpose other than looking fabulous! This fun poodle will work for any age & right up to adulthood…I should know, I have one on my shelf! You can get one right here!